Suzuki ATV Repair Manuals: QuadRunner, King Quad, QuadRacer, ALT, LT, etc. ATVs are great machines for play or work, but like with all things mechanical, you need to take good care of them. The Suzuki ATV repair manuals we sell are intended for weekend mechanics who would like to work on their all-terrain vehicles at home, and save some money by doing so. These DIY ATV manuals feature step-by-step procedures explained in simple terms along with detailed photos or line drawings of the components being serviced. From oil and filter change to tune-up to engine rebuild, get the right workshop manual for your Suzuki ATV. Need to fix your Suzuki ATV? Get a repair & service manual. Taking good care of your Suzuki ATV is not rocket science. All you'll need to perform basic maintenance jobs are a few tools (most of which you probably already own), a suitable well-lit work area and one of the ATV maintenance manuals we sell. Whether you're looking for a service manual for your Polaris Trail Blazer, a Suzuki Quadrunner 250 manual or a general ATV owner's manual, you'll find it here. These manuals are intended for the DIY mechanic and feature both step-by-step text instructions and sharp photos or illustrations of each component being worked on. The information is presented in an organized, easy-to-follow order, starting with basic general information about the ATV, troubleshooting, scheduled maintenance and tune-up, the engine, transmission, fuel, cooling (if so equipped) and electrical system, suspension and brakes, and frame and body. Most repair manuals we offer have clear wiring diagrams, so you can trace-and fix-electrical problems without wasting hours. These diagrams alone, for a lot of people working on their ATV, justify the cost of the manual. So whether you want to maintain your Suzuki ATV, get it back to running condition, all the way to a complete teardown, ground-up restoration, and reassembly, get the right manual and do the job right. 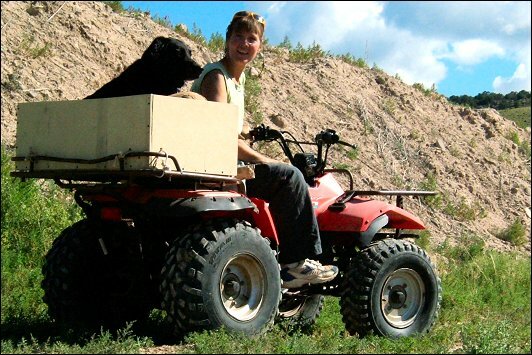 Above: Back in 2005, Kathy McCarthy bought a little ATV for $100, and then realized she had no idea how to fix it. So she found The Motor Bookstore and ordered a repair manual. It helped! And several years later, the Quad Runner is still running fine. Kathy's dog, Hawk, rides in a custom-made box.